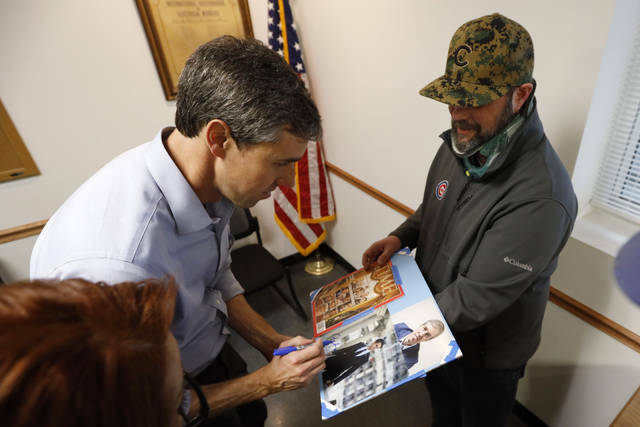 WASHINGTON (AP) — The contours of the Democratic presidential primary came into clearer focus this week with Texan Beto O’Rourke’s entry into the race — one of the final puzzle pieces in a contest that will be shaped by questions about race and gender, political ideology and generational change. The field has been awaiting O’Rourke’s decision for months. He narrowly lost the Senate race in conservative Texas in November but became a political celebrity in the process, demonstrating an easy connection with voters and an eye-popping ability to raise money from small donors. But the anticipation over O’Rourke, who served three terms in Congress, has rankled some in the party, who contend a woman or a minority would not be seen as a viable presidential candidate on the heels of a defeat. O’Rourke enters a race with no clear front-runner. 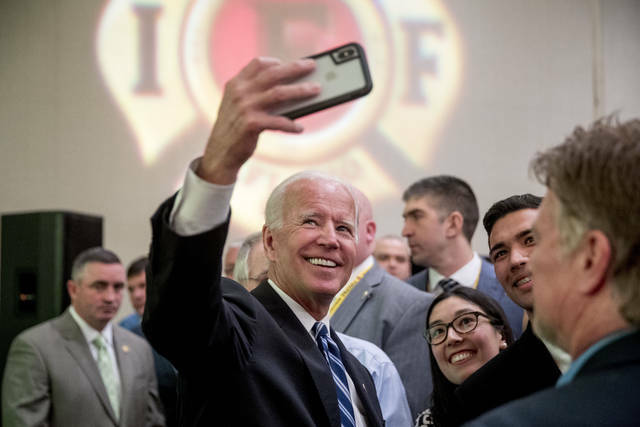 Biden and Vermont Sen. Bernie Sanders have topped early polling, reflecting the reservoir of goodwill each has with a sizable share of the primary electorate but hardly guaranteeing either an easy path to the nomination. It was notable that O’Rourke’s entry into the race was accompanied by a notable uptick in the kind of political shadowboxing the candidates have largely avoided, showing he has the attention of his competitors. Just after O’Rourke announced his campaign Thursday morning, another Texan running for president, Julian Castro, released a list of endorsements from Democrats in the state. California Sen. Kamala Harris announced she plans to headline a rally in Texas later this month. And she sent a fundraising appeal that singled out O’Rourke by name and pointedly mentioned the “record number of women and people of color” running for the Democratic nomination. O’Rourke, 46, said he knows that being a white man in a party eager to promote women and minorities may be a challenge. O’Rourke opened his campaign in Iowa. Several of his first stops were in counties that voted for Obama, but flipped to Trump in the 2016 election. He had four events scheduled for Friday. Some Democrats welcomed O’Rourke’s entry into the race. He received a handful of endorsements from congressional colleagues, who praised his unifying message. Jennifer Palmieri, a former adviser to Obama and Clinton, said the Texan’s raw talent would help raise the bar for the rest of the field. “Good candidates make each other better, and it raises the level of competition,” Palmieri said. With O’Rourke officially in the race, Biden is the only major player left to declare. A few long-shot candidates, most notably Montana Gov. Steve Bullock, may also still get in before the field is set. Biden’s team has yet to formally hire any staff. But his advisers have been signaling to Democratic operatives in Iowa and New Hampshire that the former vice president is ready to make the leap, likely in early April. He’ll deliver a speech on Saturday before a friendly audience of Delaware Democrats. Stacey Abrams, the popular Democrat who narrowly lost the Georgia governor’s race in November, has also stoked speculation about a 2020 White House run. However, people close to Abrams say she is more likely to pursue a Senate campaign. Trump is closely monitoring the Democratic primary, including O’Rourke’s announcement. He jabbed at O’Rourke’s animated speaking style, saying, “He’s got a lot of hand movement. Is he crazy or is that just how he acts?” and predicted victory over the eventual Democratic nominee. “Whoever it is, I’ll take him or her on,” Trump told reporters in the Oval Office. BURLINGTON, Iowa (AP) — Democrat Beto O’Rourke jumped into the 2020 presidential race Thursday, shaking up the already packed field and pledging to win over voters from across the political spectrum as he tries to translate his sudden celebrity into a formidable White House bid. At a house party in Muscatine on Thursday night, O’Rourke spoke about institutionalized racism, the harm done to African-Americans after emancipation and the failures of the Civil Rights movement but did not come down on either side of the reparations debate. He said only that, in speaking to others “who are much smarter on this issue,” he’s been told that the country needs to address its grim history with respect to racism before any repair can take place. “I want to make sure that we have leadership that reflects that need, that is able to reflect and share the truth and bring a reckoning to this country that is hundreds of years in the making,” O’Rourke said. He offered no further clarification on his stance on monetary or other forms of reparation, which a number of his Democratic opponents have embraced. At the house party in Muscatine, O’Rourke stood on a chair to address the dozens of curious Democratic voters who arrived to see him, taking questions from the crowd as he had all day. Sharee Byrne and Alexis Huscko, both stay-at-home-moms from Muscatine, Iowa, said they had heard about O’Rourke from his Texas Senate run and were excited to see him in person. Both were concerned about rising health care costs and access to affordable education. Byrne said she was still open to choosing a candidate, while Huscko felt strongly in Bernie Sanders’ camp. But both acknowledged O’Rourke’s charisma and looks were part of his appeal, while Huscko was less than complimentary about Trump. “I think people are more interested in having a cougar-style, GQ kind of guy, instead of the frumpy cheeto,” Huscko said. 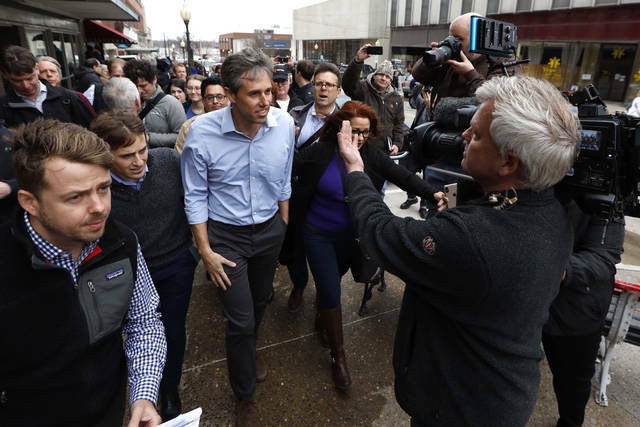 MADISON, Wis. (AP) — Beto O’Rourke is returning to Wisconsin this weekend for early campaign stops that speak to the importance of the state in the 2020 presidential race. O’Rourke is slated to appear Sunday at a coffee shop in Madison, the state’s liberal capital city, before heading to Milwaukee — site of the 2020 Democratic National Convention — for other events. It will be O’Rourke’s second visit to Madison in a month. He met with more than 200 University of Wisconsin students and faculty in February before he officially entered the race on Thursday in neighboring Iowa. Wisconsin is expected to be one of the most hard-fought states in 2020 because it is one of the few seen as being truly in play. Democrats view it as part of a “blue wall” that they hope to build in the Upper Midwest to deny President Donald Trump a second term. But Democrats have been buoyed by recent electoral successes — namely Tony Evers’ defeat of two-term Republican Gov. Scott Walker in 2018 as part of a Democratic sweep of every statewide race. O’Rourke, a former Texas congressman, made a point during his first visit in February to emphasize that Wisconsin was “too often overlooked, the conversation does not begin until too late.” He said this feeling was motivating his visits to Wisconsin and several other states, including New Mexico, Oklahoma, Kansas and Colorado. Milwaukee and Madison are Wisconsin’s two largest cities and are the center of Democratic power in the state. In 2016, Clinton carried Milwaukee County with 65 percent of the vote and Dane County, which includes Madison, with 70 percent. The former Texas congressman — who has become known for his propensity for swearing — also promised again to clean up his language, despite breaking such past vows. Many remember the Texan for declaring “I’m so (bleeping) proud of you guys” on national television during his concession speech in November, after narrowly losing his Senate race to incumbent Republican Ted Cruz. O’Rourke said Sunday that he’ll not use profanities any more, after being asked by a voter if he was going to “clean up his act,” especially in front of children. Minutes later, in front of a larger audience, de Blasio praised the Affordable Care Act, Obama’s signature legislative achievement, calling it “progress.” Obama pursued the health care legislation during his first two years in office and has been criticized at times for focusing on health care instead of the struggling economy. It was one of a handful of Trump Administration policies the New Jersey senator pledged to undo if elected president, including Trump’s tax cuts and his revocation of protections from deportation for undocumented immigrants brought to the US as children.